Deep in the comments section of Lore Sjöberg’s Wired News column on backpacks, satchels, fanny packs, and other man-purse standins, a reader alerts us that the bandolier of the author’s dreams may already exist. Bandoliers are comfortable, have very masculine overtones, and Chewbacca wore one. I could totally see dropping my miniature bleeping possessions into the pouches of a bandolier, cheerfully strapping it on, heading out into the world, and getting shot down by a paranoid security guard. That’s why it can’t be just me by myself; this needs to be a culturewide fashion move. We do find one aspect of the design particularly praiseworthy: Unlike other bandoliers (including Chewbacca’s famous “sash with pouch“), this model maintains a single width throughout its length, avoiding fussy distinctions between the Biker Bandolier’s strapping and containing functions. It’s a simple and rugged appearance, like a toolbelt broken free of its loops. Could a man-purse trend promoted by bikers spawn a “culturewide fashion move” better than a campaign led by Jude Law or Will Smith? We’d be interested in Mr. Sjöberg’s opinion. This entry was posted on Wednesday, April 19th, 2006 at 3:10 am	and is filed under Bandoliers, Fashion, Man Bags, Manufacturers, Public Image. You can follow any responses to this entry through the RSS 2.0 feed. You can leave a response, or trackback from your own site. Man, I’m not going to tell bikers what to wear. Bikers could go in for an aquamarine tulle skirt with matching pumps and I’m not going to say a damn thing. 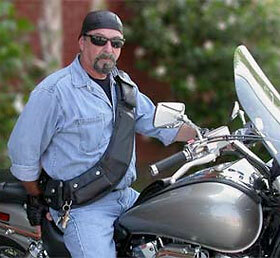 Fashion leaders, it looks like you have your mandate: Bring on the Bikers! Michael Remis is waiting.